We had hoped to save the final work on our Locost scuttle for later, so we'd have something to do while we waited for our freshly-painted frame to dry. 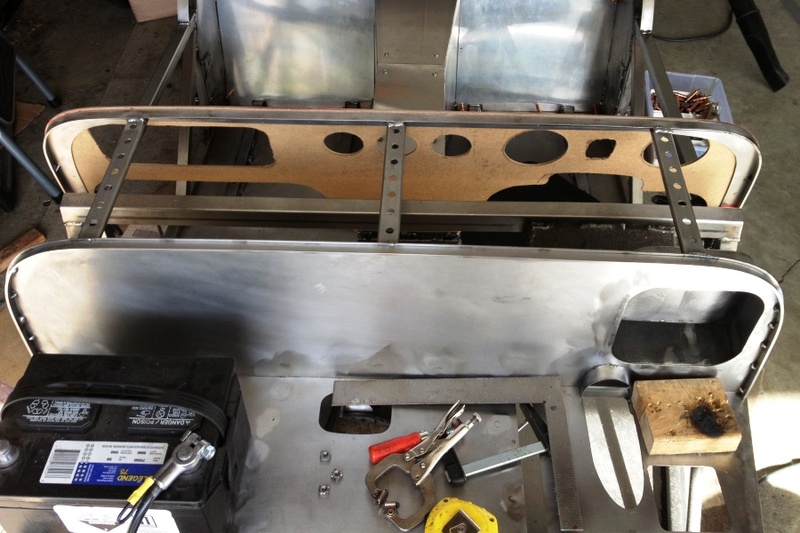 But our frame is not painted yet, freshly or otherwise, and that's holding up everything, so we went ahead and fabricated our dashboard mount and welded it to the scuttle. Yes, we are just killing time until the weather warms up. It's an unusual January in California when you don't have at least a couple of days over 70 (22 for Celsius aficionados), but maybe February will be better. Welding the dashboard mount to the scuttle was one of those jobs that appeared in the Locost book to be difficult if not impossible. 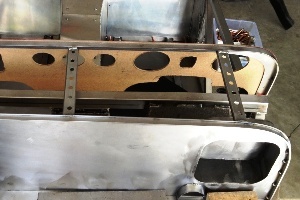 The mount is supposed to be a thin strip of 1/8" steel bent to the exact shape of the dashboard, and welded to the scuttle frame at the exact angle of the dashboard. The odds of getting all that right and expecting it to stay that way when you bend the scuttle sheeting over it seemed incredibly small. So we hedged our bets by first welding the 1/8" steel strip to a 16 gauge steel hoop, and then welding the hoop to the scuttle. Even then, the dashboard mount seemed a little wobbly, and destined to collapse under the stress of forming 20-gauge steel over it, so we welded on spacers between the hoop and the firewall. In the best Locost tradition we made these out of scraps that had been recently trimmed from our seat rail channels, thereby saving us at least fifty cents or a dollar, and as a bonus the rounded edges totally stiffened up the spacers, making them look like we designed them specifically for this job, especially after we drilled some semi-professional-looking holes in them. You may recall that our first attempt at constructing a dashboard hoop didn't go all that well. Someone forgot to take some measurements, and the hoop turned out too big. But practice makes perfect, or in our case not perfect but, you know, respectable. Our second hoop is not only the correct width, but it's also symmetrical, i.e. it has the same shape on both sides, something we couldn't quite claim for either our first hoop or our dashboard template. 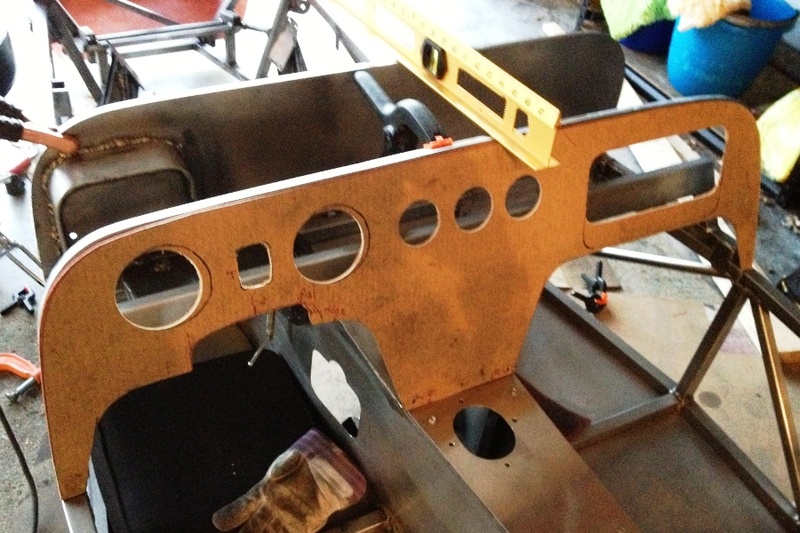 The dashboard hoop will define the shape of our actual bodywork, and we thought it would be a good idea if the car looked the same on both sides. We can't promise that'll actually happen, but we think our new dashboard hoop is a step in the right direction. Our only remaining concern is that the curves of the dashboard, firewall, and nose cone aren't totally in sync, although we're hoping this won't be a big problem. The firewall and nose are pretty close to the same shape, so we think the hood will turn out reasonably normal, and if the scuttle's a little off, I don't think this will be the first car in history with a scuttle that's not the exact the same shape as the hood. One other problem, and we think this is minor, is that our scuttle doesn't fit the frame quite as good as it used to. It's not that far off, and you can't tell by looking at it, but the precisely drilled 1/4" holes in our eight attachment tabs no longer line up exactly with the rivet nuts in our P and J tubes. So we had to drill the holes out to 9/32", and all the bolts fit again, but it's a little disappointing after spending all that time to get it just right. It seems like no matter how solid you think something is, if you melt parts of it, it's going to change. 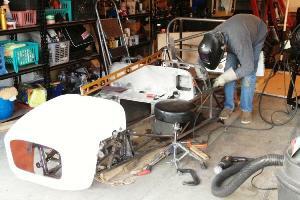 In any case we're glad the scuttle frame is done. 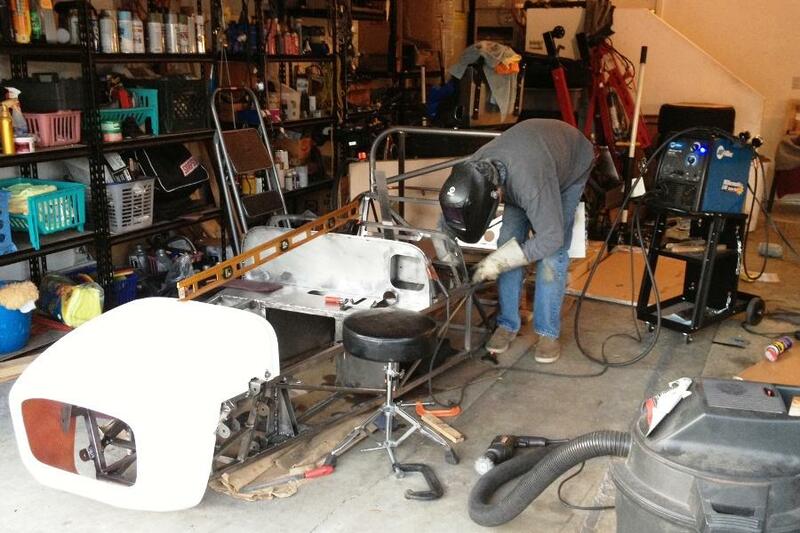 We'll know more about the shape of the car after we weld on the sheeting, but regardless of what happens we'll live with whatever sort of lump our Locost turns out to be, so long as it's a shiny lump and it's fun to drive.